Ferndale has an impressive number of events going on year round. Please check the Ferndale Chamber of Commerce site for the latest info and dates, or call the telephone numbers listed. Start your New Year off at the Ivanhoe. Fireman’s Games – The balcony of the Ivanhoe provides the best spot to watch the Ferndale Volunteer Firemen compete. Foggy Bottoms Milk Run – A family run sponsored by the Six Rivers Running Club with three different courses through Ferndale farmlands to the Main Street finish line. Race director: 707-826-8670 ext. 120. Easter Egg Hunt – Youngsters hunt for treasured eggs colored and hidden by Ferndale Scout troops. Prizes in four categories, according to age. Sponsored by the Ferndale Chamber of Commerce at Firemen’s Park. (707) 786-4477. Portuguese Easter Dance – Includes choosing of the Holy Ghost Queens for the June celebration. Sunrise Easter Service – St. Mark’s Lutheran Church gathers worshippers high on the hill at the Ferndale Cemetery overlooking the Eel River Valley to witness the dawn of Easter morning. 6 a.m. (707) 786-9353. Cinco de Mayo Fiesta – Features a parade down Main Street, Mexican Folkloric Dancing, authentic Mexican food and Mariachi music. (707) 786-9668. 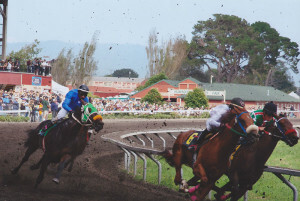 Antique Show – Collectors and vendors gather for three days at the Humboldt County Fairgrounds. (707) 786-4132 or 786-9511. Memorial Day Parade – Parade down Main Street at 10am followed by ceremonies at the cemetery. Bargain Lovers Weekend – Garage sales galore, all around Ferndale. Community Thanksgiving Service – Members of Ferndale’s six churches join together to give thanks in an ecumenical service at Assumption Church. (707) 786-9551. Annual Christmas Celebration in Song – The Ferndale Community Choir gives an encore performance, concluding in time for everyone to attend the lighting of America’s tallest living Christmas tree. (707) 786-4477.